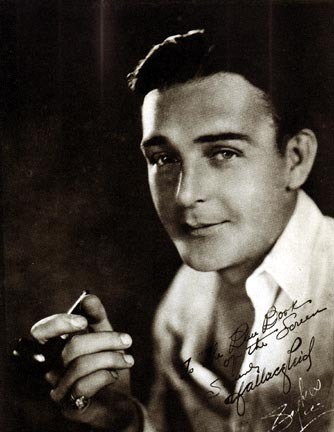 Wallace Reid was born April 15, 1891, into a theatrical family. His mother was a leading lady, and his father was an actor, playwright and later director and actor in films. He went to pre-med school and served as a reporter and a surveyor, but decided he would be happier acting. He began on the stage, with the help of his father, but by 1910, he began his film career with Selig and made over 100 short for Selig, Vitagraph, Reliance, Universal and others. In addition to acting, he worked as a cameraman and writer. While making the 1912 short "His Only Son" for Reliance, he met Dorothy Davenport, and they were married the following year. Although he made other films of note, his appearance as the muscular blacksmith in D.W. Griffith's "The Birth of a Nation" (1915) also brought him notice. In mid-1915, he signed a contract with Paramount and stayed with this company for the rest of his career. His fame was cemented with he co-starred with Geraldine Farrar in "Carmen" (1915) and "Joan the Woman" (1917). Reid made the first of his racing films in 1919, entitled "The Roaring Road." After that, he was most readily identified with this type of entertainment making several others such as "Double Speed," "Excuse My Dust" and "What's Your Hurry?" He made other types of films, too, with some of the major female stars of the period including Ann Little, Anna Q. Nilsson, Bebe Daniels and Agnes Ayres. He starred in two of Cecil B. DeMille's "bedroom" pictures opposite Gloria Swanson, "The Affairs of Anatol" (1921) and "Don't Tell Everything" (1921). Reid had made 32 features for Paramount when he was selected to star in a lumbercamp story "The Valley of the Giants" in 1919. The film was being made in the High Sierras, and the train carrying the company on location was involved in a wreck which badly injured Reid. Reportedly, Reid was supplied morphine for his pain, to which he eventually became addicted. He made 23 more films without fan realizing there was a problem. However, those who worked with him on his last film, "Thirty Days" (1922), claim his condition was very poor. As soon as the picture was finished, he checked into a sanitarium but died Jan. 28, 1923. His death came as a shock to fans because Reid was apparently the epitome of the happy family man, very athletic, able to play several instruments and very well-read. His wife made the anti-drug film "Human Wreckage" in 1923, and a few other social conscious films continuing as a producer, writer and director for many years. She died in 1977, having never remarried.